Needless to say, I’m picky about food. Over the years, I’ve become much more open-minded about trying new and different flavor combinations, but I seem to be getting choosier all the time about exactly where my food comes from and how it was raised/grown/caught/delivered. Kurt dreads the string of questions I ask about the menu when we try a new restaurant. I’m especially picky when it comes to seafood, but there are some handy clues for deciphering seafood dishes on restaurant menus. “Atlantic” salmon always means farmed, and therefore, I avoid it. If the menu also mentions bluefin tuna, Chilean sea bass, or orange roughy, I’ll probably just want to leave. The news about different types of fish is constantly changing, and overfishing is an ongoing concern. But, maybe it’s not too late to do something about it. When I heard about the new book, The Perfect Protein: The Fish Lover’s Guide to Saving the Oceans and Feeding the World , by Andy Sharpless, CEO of Oceana, I was very interested in learning what tips it offered. I received a review copy of the book, and I’m also one of the Perfect Protein bloggers. The book covers how we got to where we are with unsustainable fishing practices, how many people around the world rely on fish as a food source, what we could be doing differently, and how the fish in the sea could become abundant again one day. The book includes success stories of places where regulations have been put in place, and fish populations have improved significantly. The three steps outlined to bring about sustainability are: “set science-based fishing quotas, reduce bycatch, and protect habitats.” What consumers can do includes being informed about sustainable seafood options; choosing wild seafood, smaller fish like anchovies and sardines, and mollusks more often; and spreading the word about the issues. One of my favorite quotes regarding sustainable seafood is from chef Barton Seaver: “It’s our patriotic duty to eat as many farm-raised shellfish as we can.” While most fish farming is an environmental nightmare, farmed shellfish is a completely different story. Clams, oysters, and mussels are natural filters or “water scrubbers.” They feed on the lowest level of the aquatic food chain and improve the water quality where they’re grown. So, enjoy eating mollusks as often as you can. The Perfect Protein book includes recipes for some of the best, sustainable seafood options from several well-known chefs, and I wanted to highlight a dish with mussels. The Thai Coconut Mussels dish is from Sam Talbot of Season Two of Top Chef. 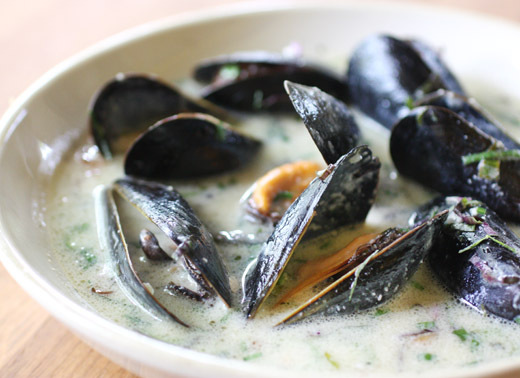 I always start by soaking mussels in a big bowl of water with a few tablespoons of flour for about 30 minutes. This helps with eliminating sand and grit. Then, the mussels should be rinsed, and any beards still attached should be pulled off with the edge of a knife. To start the cooking, a few tablespoons of olive oil were heated in a large Dutch oven, and three tablespoons of grated ginger, four minced garlic cloves, one finely chopped shallot, and two tablespoons of finely chopped lemongrass were added. In a couple minutes when fragrant, two tablespoons of unsweetened, ground coconut was added followed by a pound and a half of cleaned mussels. The heat was turned up to medium-high, and then a tablespoon of soy sauce and one teaspoon of fish sauce were added. I also added some finely chopped, fresh chiles. After about one minute, three-quarters of a cup of coconut milk was added, the pan was covered, and the mussels were left to cook for about four minutes or until opened. Any mussels that don’t open should be discarded. The opened mussels were placed in serving bowls, and cilantro and mint leaves along with the juice and zest of two limes and some Thai basil and purple basil from my herb garden were added to the coconut milk. I also added some thinly sliced lime leaves from my tree. 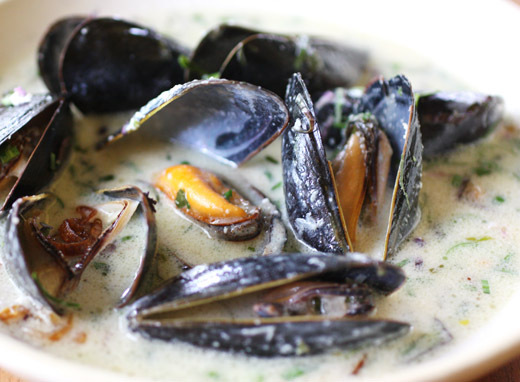 The coconut milk broth was poured over the mussels. The herby, spicy flavor of the coconut milk broth was a great match for the mussels, and some rice noodles were ideal for slurping with the extra broth left in the bowl. It’s not easy to always make perfect choices in the ever-changing world of sustainable seafood, but learning about the issues makes it possible to do better as often as we can. Love Thai kitchen! The mussels look very fresh and moreish. We love mussels and buy them and cook them often, normally in a rich but delicate broth. French, of course. The Thai flavors of the broth look and sound so beautiful! The dish is mouthwatering! such an informative post - I really do need to ask more questions about where my food comes from. what a lovely way to cook mussels, this sounds so wonderfully flavorful! I actually tried mussels (for the third time) recently, and I'll confess I haven't learned to appreciate it, particularly the texture. But I do appreciate a beautiful food photo when I see one. As well as information on what to look for and what to avoid regarding seafood. Sounds like a wonderful, informative book, Lisa. Nothing I like better than mussels too. The coconut milk broth sounds marvelous. Also liked reading your previous post...put that one on my wish list! This book sounds excellent - certainly your review was excellent and extremely informative! I love shell fish but don't eat it enough - I definitely need to do more. 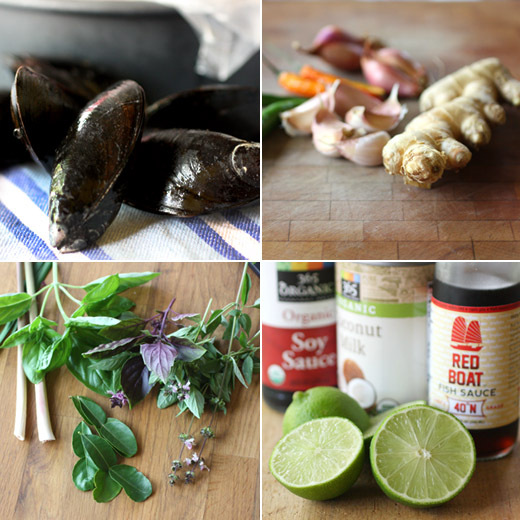 Mussels are a particular favorite, and the recipe for Thai Coconut Mussels looks terrific. Wonderful post - thanks so much. We are both big mussels fans, and we have eaten them in so many different ways. It is really interesting that you've explained the ways in which farmed shellfish differ from farmed fish. It's nice to know that eating the shelled guys isn't as deterimental! Looking at these gorgeous pictures, I'm just graving for mussels. , The more people know about these issues, the better. nice way to add such exotic flavor to your mussels!! Looks so creamy and delicious! I prefer clams to mussels most of the times, but with a coconut-based gravy, I believe mussels is the way to go for this dish. I've always wanted to try mussels. Down here in SA, I only get salmon-- I've gotten bad fish before and it's NO good! I definitely wasn't exposed to seafood or fish enough as a kid which is probably why I'm so apathetic to it today. These mussels look gorgeous though...totally making me want to dive into that bowl! What a truly inviting dish. I love all the herbs that are used in this broth to really bring it all together! Wow... this is stunning! I am getting so hungry right now. Although I don't really love mussels, your dish just looks very irresistible. I probably have to lick clean that broth. I have a few ways of organizing recipes. I have files of pages cut from magazines that are organized by type of dish: beverages, appetizers, soups, salads, cookies, cakes, breakfast, mains, holiday menus, vegetarian, etc. When I try those recipes and like them, I re-type them (with any changes I make) into a huge Word file that's organized in the same way. I also keep links to online recipes on Evernote. And, for finding recipes from books, EatYourBooks.com is a lifesaver. You enter all of your titles, and then you can search based on what you own. Love love love Thai food. A very scrumptious and beautiful curry. Interesting information and I love the dish.